The classic example of ecology shaping evolution is of the peppered moth. During the Industrial Revolution in 18th century England white peppered moths were only too visible to their predators on soot-covered trees. The moths were almost on their way to extinction when natural selection found its voice. Curtains dropped over the white ones and in came the black-peppered moths. But there are two sides to the coin, biologists realize now. “Ecology and evolution interact with one another such that evolving organisms can also alter their own ecology,” said David Reznick, biologist at the University of Pennsylvania, usa. Ronald Bassar from the University of California and his team including Reznick chose the Trinidadian guppies (Poecilia reticulate) to prove this symbiosis. These are small freshwater fish found in upper mountain streams. Upstream the fish face fewer predators like the killifish which may prey on younger guppies. Since they are not on the run most of the time, they grow slowly, live longer, eat more algae than insect-larvae, mature late and produce fewer, bigger babies. The waters here have lower algal blooms. Downstream the case is different. Fish species are diverse including the pike cichlid, a serious guppy hunter. So the guppies are always on their toes and the ambience is quite like what happens to the siblings of Nemo in the eponymous movie. 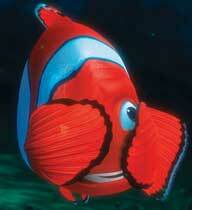 At one moment they are eggs about to hatch, at the other a predator from the blue has gobbled them up—all except Nemo. So the real life guppies mature early, produce several babies and grow smaller—it helps to escape the clutches of predators. They are also more carnivorous than herbivorous. So the waters here have more algae. Bassar replicated the entire setup in an artificial stream and then reversed the guppies’ positions: fat, lazy fish were sent to live downstream where they were suddenly in danger of the guppy hunter. The guppy-hunter warriors were sent upstream where, compared to facing the cichlid, killifish was child’s play. Consequence: the displaced fat, lazy fish downstream had to get into gear and become quicker and more alert than they ever were. They became good hunters too, catching and eating more insect larvae—a richer source of proteins—than the algae. The algal concentrations of these waters increased. They matured soon, stopped wasting time on mating rituals, and produced more, smaller babies. Upstream the warriors took it easy, grew slowly, turned vegetarian, grew fatter and produced big babies. Detritus, water and faecal samples pointed to the enlightening facts: these waters turned fresher with lower algal blooms and more oxygen. The guppies evolved to change the ecology of waters upstream to that of downstream and vice-versa. Proceedings of the National Academy of Sciences published the study online on February 1.